To schedule a makeup for a student, the student must have been marked absent and must have Eligible for Makeup checked for that absence. A makeup can be scheduled from the Class record or from the Student record. Go to the Absences tab of the Class record (the class the student was absent from). Click the number next to the appropriate student name to open the Absence History listing. Locate the absence you want to schedule the makeup for and click the Schedule Makeup link. This will open the Weekly View calendar. 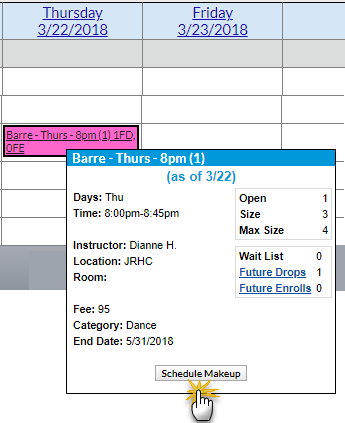 After locating a makeup class, hover over it to display the class information and click the Schedule Makeup button. You are returned to the Absence History listing which now shows the makeup class information. Click Return to go back to the Class record. Go to the Absences tab in the Student record. Click the Schedule Makeup link for the appropriate absence to open the Weekly View calendar. You are returned to the Absences tab of the Student record which now shows the makeup class information. The Class Size Makeup Limit (Tools > Edit Settings > Class Settings) determines whether you allow makeups to be scheduled into full classes. If you do not want makeups to exceed the maximum number of students allowed in the class as per the Class Max Size on the Class record, set this to '0'.